We will be looking at the expression and scaling math functions. The math equation element will allow us to write complex math equations that will be solved when the instruction is executed. It operates on a 16 or 32 bit signed integer or 32 bit real numbers. You cannot mix these numbers in the equation instruction. To configure the math equation it must be in the following format. When the instruction is activated, or on the equation is solved. If a math error occurs (divide by zero), the element is off and the value placed in the result is invalid. 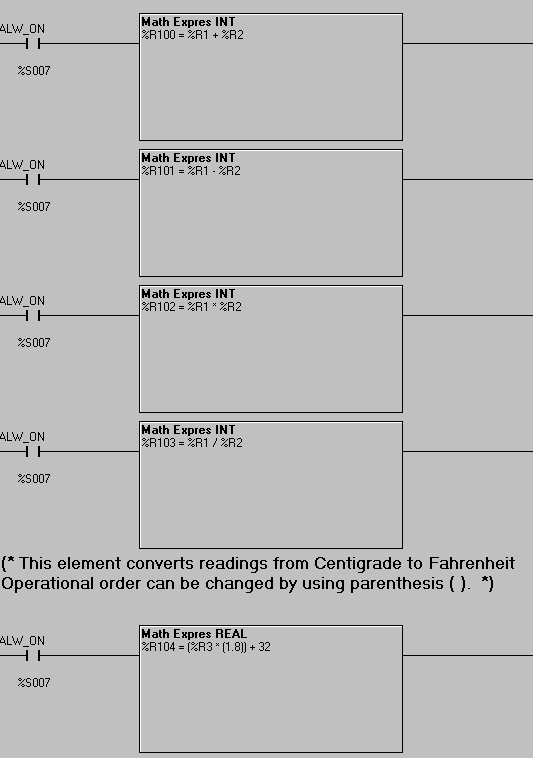 Here is some logic in the PLC ladder logic diagram example. The last rung in the ladder above will convert Centigrade to Fahrenheit. You will notice that the brackets can be nested as much as you like. The limit is 80 characters for the equation. Real numbers were used because of the decimal point used in the equation. If I had used 9/5 instead of 1.8 then my equation would not have been accurate when using the INT and DINT values. 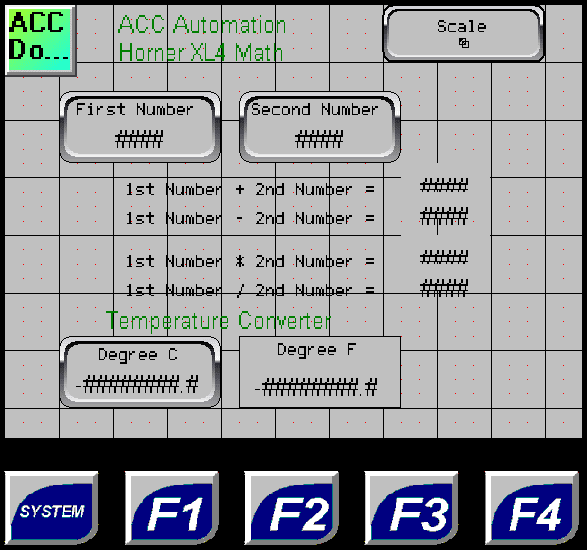 Here is our Horner APG screen for the math expression instruction. The scaling math function is often used to convert an analog value into something that is more meaning full to the operator. Note: Scaling will only work on INT, Floating Point (Real) and Double Floating Point (LReal) numbers. We are going to use a slider input on the screen to go from 0 to 5000. This input is coming from register %R00150. The scale instruction will take this value from 0 to 5000 and give me a percent. 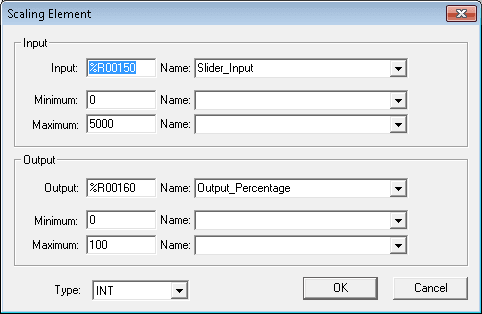 %R00160 will be the output that is scaled from 0 to 100. 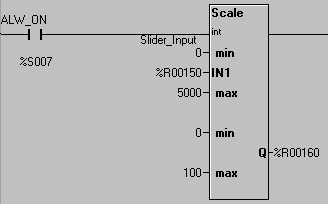 Here is the PLC ladder logic diagram example for the instruction. The system bit %S007 is the always on bit that will always execute this scale instruction. 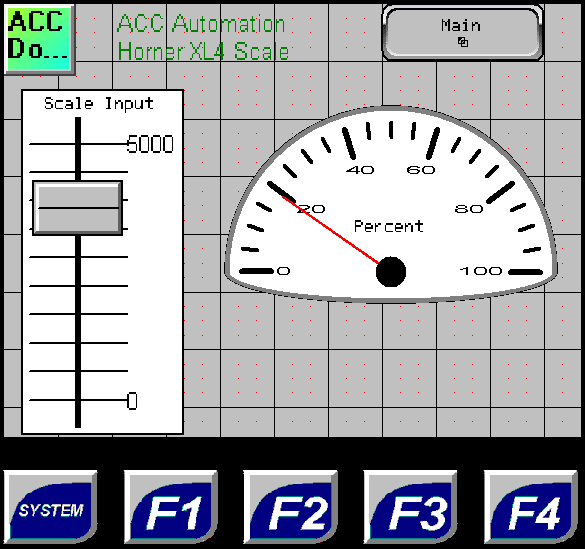 Here is our Horner APG screen for the scale instruction.